The Lawn Institute has an extensive list of benefits and value of maintaining natural lawns or real turf grass in our society. They point out a number of benefits including environmental, economical and even psychological issues to make the case in favor of real turf grass. They do not however, make a side by side comparison to the artificial grass alternative. So as you read through all of these benefits, think if artificial grass would provide the same benefits. I particularly liked the quote , “Surveys conducted by … bare out the fact that green space and especially green lawns may be as American as apple pie, hot dogs and baseball”. The issue is green open space. More than 90% of homeowners surveyed feel that having a well maintained lawn improves property values. I often bring up artificial grass as an alternative to real turf grass in most cases where the grass area considered is not too large. Since artificial grass costs much more than natural sod, homeowners often ask, “how much more is it?”. I have found that it is generally 2.5 to 3 times more in terms of initial costs. The maintenance costs including the cost of water should also be factored in over time. Costs however may not be the only deciding factor and that is where the quote about grass being “as American as apple pie, hot dogs and baseball” is intriguing. I cannot cite an actual survey, but I do believe that all costs and environmental comparisons put aside, people would prefer the real thing over the fake alternative. People naturally will gravitate towards something natural when presented with a “fake” substitute. Artificial is perceived as having less value and desirability. It’s also perceived as being inferior, cheap, less prestigious and not as sophisticated as the real thing. This is often true with plastic alternatives to natural materials such as stone or plants. Fake indoor plants are lifeless substitutes for real indoor plants. So of course we would prefer real grass over something fake until we educate ourselves beyond this simple fake vs. real comparison. Studies have shown that patients in hospitals and nursing homes that have view onto a natural landscape, perhaps one with a nice green lawn improve their conditions compared to patients who are not exposed to those same views. I wonder if those same benefits would be experienced if artificial grass were present. Given today’s technology of being able to make fake grass look as real as natural grass, I would guess that it would have the same psychological effects. Another psychological factor is the degree of enjoy-ability. 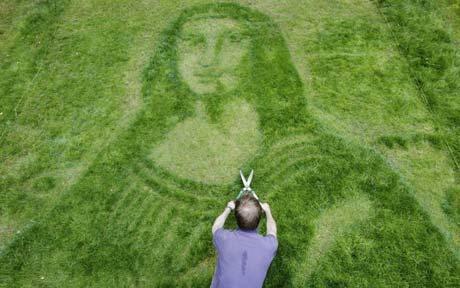 Some people take great pride in maintaining their lawns even though they spend hours maintaining it. They see their lawns as an extension of their own identity, and if exposed to the public as in the case of the front lawn, may even be more sensitive of how they (and their lawn) are perceived by their neighbors. Artificial turf takes away any ego identification with how well it is being maintained. They may even be concerned about being labeled as “the guy with the fake grass”. But as the technology to recreate the real lifelike appearance of natural grass improves with the synthetic alternatives, more and more people will be fooled into believing it is indeed real. And when that happens without the homeowner disclosing that its fake at the outset, they can only feel proud of their choice because almost everyone is usually quite astonished when they are told that it is indeed artificial grass. Here is the laundry list of benefits of real grass as cited by The Lawn Institute. and where you can find the citations made regarding the survey results.